Current trends and challenges in marine biodiversity strongly suggest the need for an interdisciplinary approach in policy and research. The integration of different fields into the marine sciences, in particular, is crucial in crafting effective frameworks to address the twin goals of protection and conservation. Avenues to encourage a plurality of perspectives on marine biodiversity should thus be promoted. In this context, the UP Institute of Maritime Affairs and the Law of the Sea (UP IMLOS) is pleased to host its second conference on Maritime Affairs and the Law of the Sea to be held on January 3-4, 2017, at the University of the Philippines College of Law. The theme for this year is Marine Biodiversity Conservation: Dealing with New Normals and Evolving Challenges. The conference will thus provide a forum for exchanging ideas on the breakthroughs and special challenges surrounding the field. Participants are invited to present their research on conservation and protection efforts, and contribute towards understanding the interface between practical management and interdisciplinary approaches. What are the contemporary challenges in the protection and conservation of marine biodiversity? Are existing regimes for geographic and jurisdictional governance of marine biodiversity (e.g. territorial seas, enclosed and semi-enclosed seas, EEZs, the continental shelf, the high seas), sufficient for its protection and conservation? Are the law, the sciences and/or other fields able to adapt to contemporary challenges and future trends in the protection and conservation of marine biodiversity? 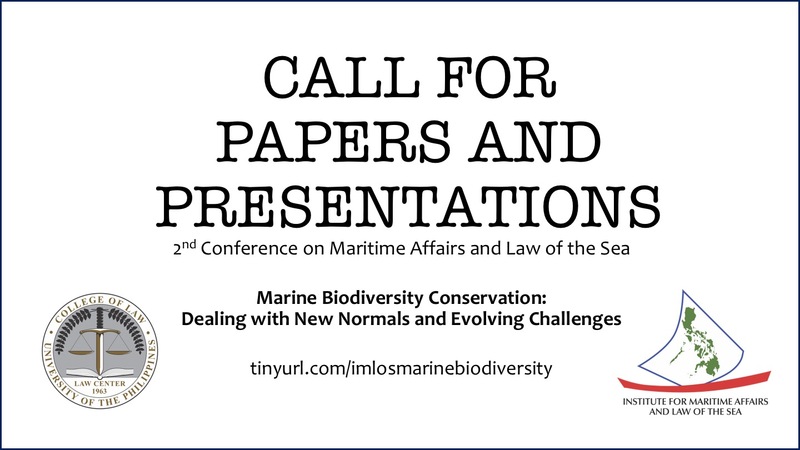 This entry was posted in Past Events and tagged conference, environmental law, marine biodiversity, maritime affairs, maritime law on September 15, 2016 by Institute for Maritime Affairs and Law of the Sea. The Institute of Maritime Affairs and Law of the Sea (IMLOS) of the University of the Philippines Law Center held a symposium on the legal implications of the New Bangsamoro Waters and the Zones of Joint Cooperation last March 18, 2013 at the UP Law Center. The speakers were experts and individuals involved in the process of drafting the Comprehensive Agreement on the Bangsamoro. 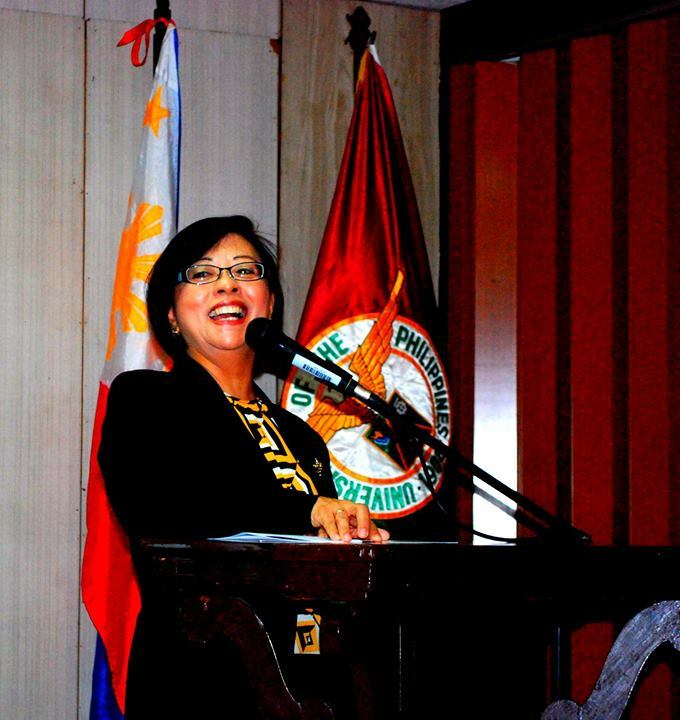 Professor Miriam Coronel-Ferrer, chairperson of the GPH Peace Panel, discussed the Addendum on Bangsamoro Waters and Zones of Joint Cooperation. She discussed the impact of wealth sharing and power sharing on the Bangsamoro Waters, and touched on the topic of preferential fishing rights in the Zones of Joint Cooperation for the Bangsamoro and other indigenous peoples in the adjoining provinces. IMLOS Director Professor Jay Batongbacal, who assisted the GRP Panel on crafting the initial ideas for the Bangsamoro Waters discussed the legal geography of the new Bangsamoro Region. 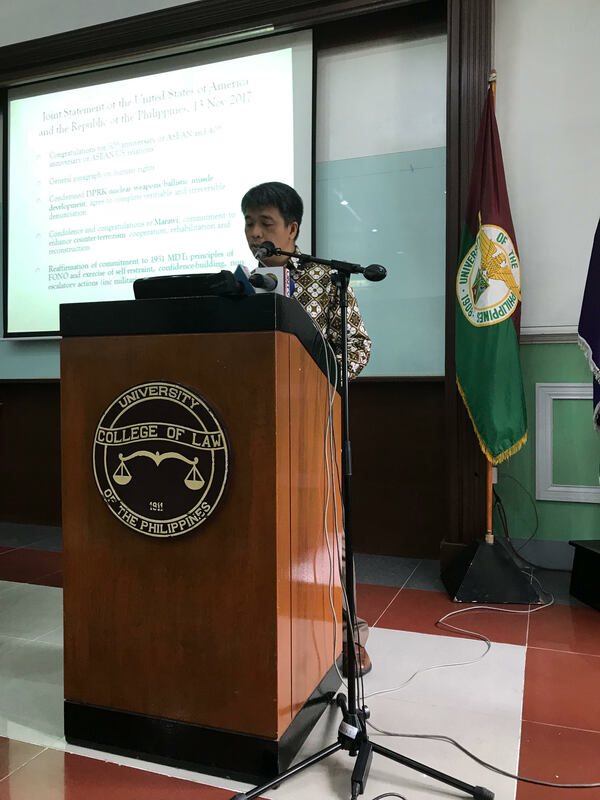 Professor Dante Gatmaytan, a constitutional law expert commissioned to assist in working out the terms on natural resources and ancestral domain, discussed the constitutionality of the Bangsamoro Basic Law. He describes the agreement as a test on the limits of our Constitution in the context that it is reconciling a separatist movement with a constitutional regime. He concludes that Comprehensive Agreement on the Bangsamoro can be accommodated by the present legal framework and the enumeration of powers therein is in consonance with Article X of the 1987 Constitution. 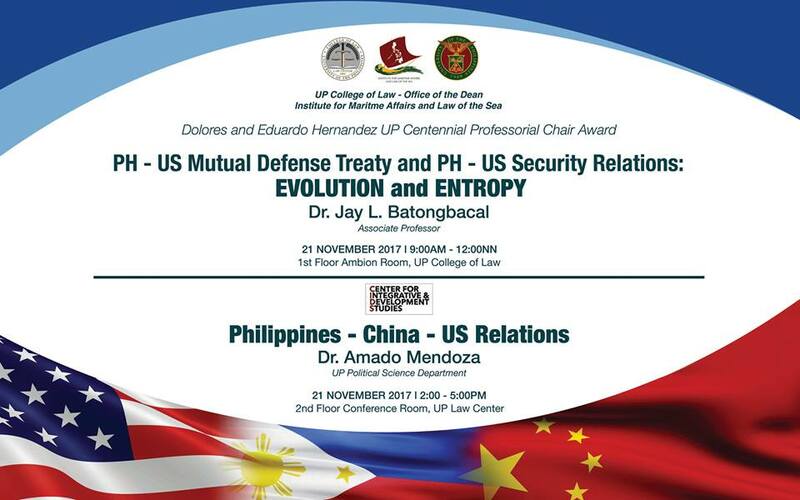 Dr. Diane Desierto, an expert in international economic law and professor at the University of Hawaii – Richardson School of Law, provided views on investment implications of the Bangsamoro agreement and its annexes. She pointed out things to consider under the annexes that need to be managed in terms of the expectations of the Bangsamoro having exclusive powers over investment and the central government spelling out investment policies on the treaty level and the national legislative level. Reactions and questions were raised by representatives from different sectors such as fisheries, petroleum, maritime transportation, marine conservation and protection, and indigenous peoples. Undersecretary for Political Affairs Chito Gascon joined the speakers in responding to the reactions and inquiries raised by the audience. Prof. Batongbacal ended the symposium with his synthesis of the speakers’ messages and the reactions of the audience. He said that there are still several issues to be resolved, such as clarifications on the impact of the Bangsamoro Basic Law with existing laws and the creation of dispute resolution mechanisms, as the agreement was not designed to cover all the issues that may arise. The various points raised in the symposium will be forwarded to the Bangsamoro Transition Commission, Office of the Presidential Adviser on the Peace Process, and the GPH Peace Panel. The signing of the Comprehensive Agreement on the Bangsamoro is set tomorrow, March 27, 2014, at the Malacanang Palace which will end the seventeen years of negotiations between the Philippine Government and the Moro Islamic Liberation Front. This entry was posted in News and Updates, Past Events on March 28, 2014 by Pia Benosa.